It happened to be hat day at school. Isaak always wants to wear this big sombrero that we have hanging in our Mexican themed kitchen. We found a gigantic icicle. I had to take a picture. I want to see your Mexican themed kitchen! That seems like such a fun idea! 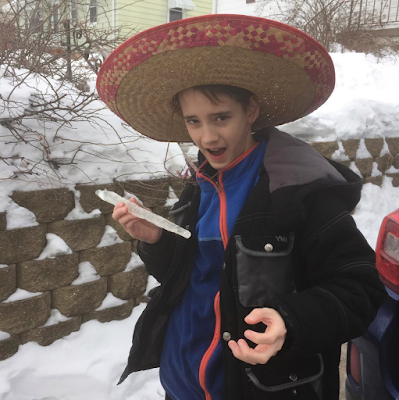 How rare that you see a sombrero in the snow! That is a huge icicle! That is pretty cool. Thanks for sharing it. Thanks for hosting and I hope that you have a wonderful week. It doesn't get any more random than that! LOL!